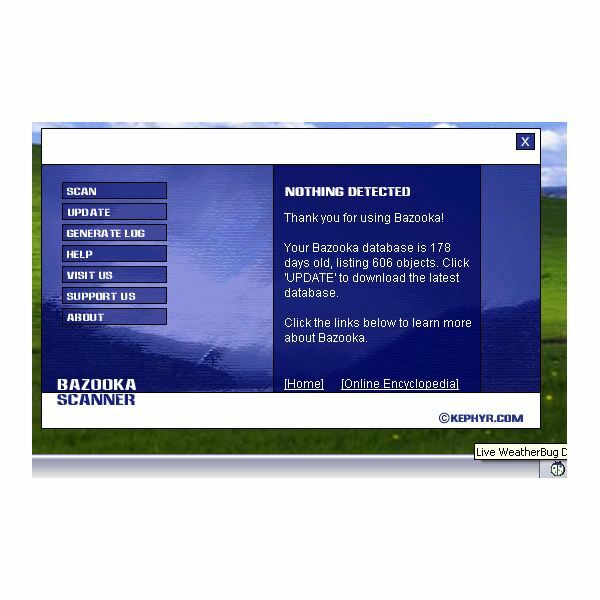 Bazooka Adware and Spyware Scanner (BASS) by Kephyr.com is a free tool to scan the system for spyware and adware. Find out if this neat and simple scanner is a must have. BASS supports Windows XP and older edition of Windows operating system. The file size of its installer is less than 800KB only. The installation process is quite simple and straight-forward and you do not need to restart your computer to start using BASS. There’s no program shortcut on the desktop but you will find it in the Start Menu in Windows. BASS will use 1.66MB disk space and can be uninstalled using its own uninstaller or via Add/Remove Programs utility in Windows. When you launch the program the first time, an option to sign-up an e-mail address to receive newsletter about new software releases. The program do not support newer Windows OS and there’s no way to do anything other than to scan. Bazooka Adware and Spyware Scanner is a very simple program with neat user interface. The program will scan for spyware, adware, keyloggers, unwanted programs and dialers. BASS let you check for update for its database detection for free. However, it does not include a removal engine, real-time protection, custom scanning and any other useful options that we usually find in other spyware and adware scanners. If a threat is detected by Bazooka, you will be presented by threat name and a link to self-help guide in manually removing the threat. An example of the self-help guide is here. The program currently detects 606 objects and you can find what BASS can detect in its online encyclopedia. Example scan result of Bazooka scanner is in the below screenshot. WeatherBug v6.03 is listed in online encyclopedia but the new build of WeatherBug on this test is v6.8 which is not detected by BASS. If any listed threat is not detected by BASS, there is option to generate a log and send it via email to allow Kephyr.com in updating the detection database. Scan time is done in just seconds because the database is quite small. While free is good, the fact is that there are several other free programs available which will do the job much better than Bazooka. Bazooka Adware and Spyware Scanner is neat tool but the number of detection is very few and it is updated infrequently. Look somewhere else to get fast detection with free automatic removal of spyware, adware and other potentially unwanted programs!